Reinhold Friedrich is one of Europe’s most renowned trumpet players and pedagogues. Since 1989 Professor at the Staatliche Hochschule für Musik in Karlsruhe, Germany, Friedrich is prize-winner of the international ARD competition and has played and performed across the world with a variety of orchestras such as Capriccio Basel, BBC Symphony Orchestra, Wiener Symphoniker, Royal Concertgebouw or the Taiwan National Symphony. Friedrich is an outstanding pedagogue who is appearing regularly at masterclasses around the world and captivates students with his authentic, unique way of teaching. In this honest, down-to-earth and super hands-on class, Reinhold Friedrich shows the basics of how to master the trumpet, his approach and goes through his complete warm-up program. Intro to the Friedrich trumpet fundamentals and some lip buzzing to start off with. Lip buzz and then some mouthpiece buzzing is essential to get the lips going and loosen it all up. No warm up without some Chicowitz. Let Reinhold show you how he does it to make it sound so great. Another important exercise that will gradually get your range developed. Agility and fingers are developed through some chromatic work that helps loosen you up and makes your fingers flexible. A classic exercise – tricky and great for coordination. Articulated scales all the way to the top and down again, articulated! How do you play it clearly with a full, focused sound while moving around? Bending notes in Stamp 1 will round off this warm up of trumpet fundamentals exercises and give you the best fundament for your playing. EXCELLENT TOOL FOR STUDENTS AND TEACHERS!!! It is great to see how a great trumpet player and musician like Reinhold Friedrich warms up. A really insightful video that has benefited me greatly. Very inspiring video - a famous player AND pedagogue shows the basics of his way to play the trumpet. I've watched it many times and still find new inputs for my playing. I Love his full Sound! Amazing player and one of the must have videos! You can see his warm up and his philosophy of getting that sound and be a better player! Thanks! I love how honest this video is. One of the greatest players of today showing his warm up and routines 'in real time. Absolutely one of the must have videos in this series. Also love the blue shorts!! I love Reinhold Friedrich works very much and I wish someday I can study with him. This one is great I learn a lot from him my play get better and better by follow his very good advice in this video. For me I think it's worth for the money and everyone should have it! Thank you for your's great work! In Masterclass no 1 Reinhold Friedrich teaches Tomasi´s Concerto. One of the most tricky pieces for trumpet taught and explained by one of todays greatest trumpet players. Learn from an amazing musician and trumpet player, improve your own playing, copy the movies to your iPad or iPhone to learn and get inspired from wherever you are. Since his first prize in the international ARD competition in Munich in 1986 he has been present on the important stages of the national and international music scene. From 1983 to 1999 he has been Soloist at the Radio-Sinfonie-Orchester Frankfurt and performed under conductors like Eliahu Inbal, Dimitri Kitayenko, Erich Leinsdorff, Christoph Eschenbach and Hugh Wolff. Since 1989 Reinhold Friedrich is Professor at the Staatliche Hochschule für Musik in Karlsruhe. Reinhold Friedrich teaches Honegger´s Intrada in Masterclass no 2. One of the most popular pieces for trumpet taught and explained by one of todays great trumpet players. Get tips and tricks from a true trumpet master.Since his first prize in the international ARD competition in Munich in 1986 he has been present on the important stages of the national and international music scene. From 1983 to 1999 he has been Soloist at the Radio-Sinfonie-Orchester Frankfurt and performed under conductors like Eliahu Inbal, Dimitri Kitayenko, Erich Leinsdorff, Christoph Eschenbach and Hugh Wolff. Since 1989 Reinhold Friedrich is Professor at the Staatliche Hochschule für Musik in Karlsruhe. 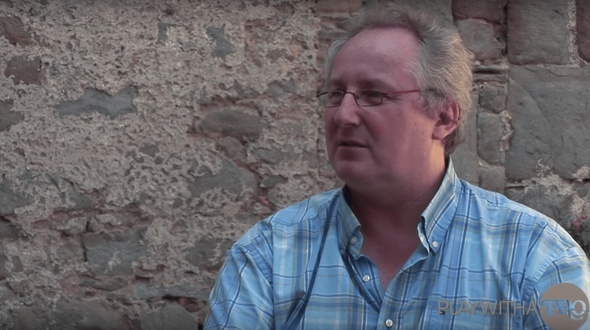 Watch Reinhold Friedrich talk about his life as a trumpet player. Get rare insights into how a top player works and thinks.Since his first prize in the international ARD competition in Munich in 1986 Reinhold Friedrich has been present on the important stages of the national and international music scene. From 1983 to 1999 he has been Soloist at the Radio-Sinfonie-Orchester Frankfurt and performed under conductors like Eliahu Inbal, Dimitri Kitayenko, Erich Leinsdorff, Christoph Eschenbach and Hugh Wolff. Since 1989 Reinhold Friedrich is Professor at the Staatliche Hochschule für Musik in Karlsruhe. As a solo player, he gave concerts with ensembles such as Berliner Barock-Solisten, Cappella Istropolitana, Franz-Liszt-Kammerorchester, Wiener Kammerorchester and Zürcher Kammerorchester. 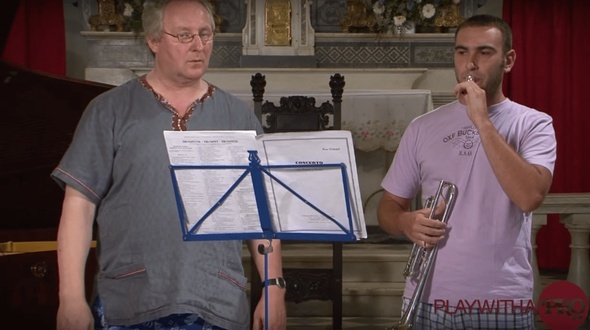 The best start of the day for any trumpet player!Reinhold Friedrich needs no further presentation for most people interested in trumpet playing. Download or stream this HD movie and attach your computer, tablet or smartphone to a pair of loud speakers whenever you warm up, and play along in this detailed warm up program. Since his first prize in the international ARD competition in Munich in 1986 he has been present on the important stages of the national and international music scene. From 1983 to 1999 he has been Soloist at the Radio-Sinfonie-Orchester Frankfurt and performed under conductors like Eliahu Inbal, Dimitri Kitayenko, Erich Leinsdorff, Christoph Eschenbach and Hugh Wolff. Since 1989 Reinhold Friedrich is Professor at the Staatliche Hochschule für Musik in Karlsruhe. Do your daily warm up program together with a group of talented students a¨led and guided by Reinhold Friedrich.